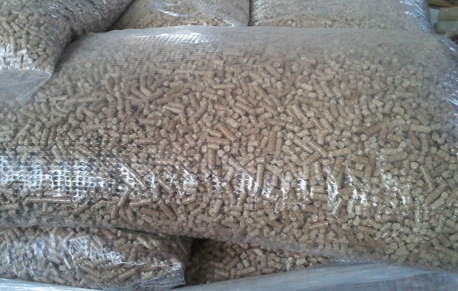 Pellets are produced from ground and dried biomass, which is obtained as technological waste during wood article production. When necessary biomass is fragmented to suitable size and dried in special drying installations to 6 – 8%. Pellets are produced by compressing the wood material which has first passed through a hammer mill to provide a uniform dough-like mass. This mass is fed to a press where it is squeezed through a die having holes of the size required (normally 6 mm diameter, sometimes 8 mm or larger). The high pressure of the press causes the temperature of the wood to increase greatly, and the lignin plastifies slightly forming a natural "glue" that holds the pellet together as it cools. Pellets can be made from grass and other non-woody forms of biomass that do not contain lignin: distiller's dried grains (a brewing industry byproduct) can be added to provide the necessary durability. The product obtained this way has very good technological, ecological and economical characteristics, especially when compared to products of the main competitors – wood, coal and oil products. The products are unmatched in the local market. Pellets are most widely used in Sweden, mainly as an alternative to oil-fired central heating. In Austria, the leading market for pellet central heating furnaces (relative to its population), it is estimated that 2/3 of all new domestic heating furnaces are pellet burners. In Italy, a large market for automatically fed pellet stoves has developed. Pellets can be used in boilers with special burners. They are comfortable for storage and transportation. They do not give off harmful gas and don’t contaminate the air and soil. The ash can be used as manure. Highly caloric: 4700 - 5800 kcal.